When you add storage devices under storage infrastructure in Veeam 9.5 it will automatically reconfigure backup jobs that target VMs that are stored on the newly configured storage to use storage level snapshots and NOT to fail over to vSphere snapshots. This doesn't cause any issues if your storage integration works smoothly, but if it doesn't you will have to manually reconfigure all backup jobs to fail over to vSphere snapshots. This is terrible software design. Adding a new configuration element shouldn't silently reconfigure existing jobs without notifying the operator and certainly shouldn't do so with no fail over configured. This leads to a second issue: you cannot configure snapshot preferences on Veeam Zip jobs. 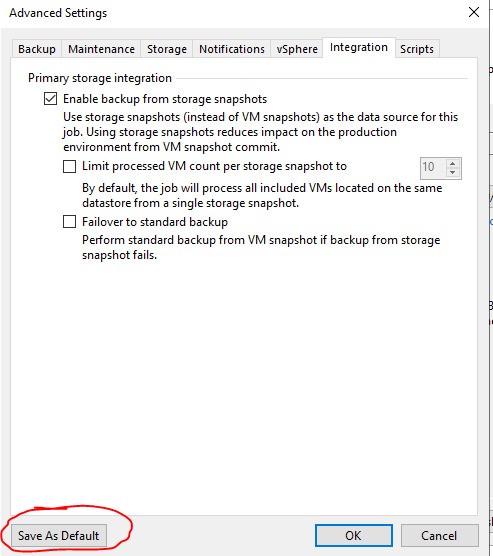 So if your storage level snapshots are failing you have no way to take Veeam Zips without removing the the storage appliances from storage infrastructure (which you cannot do if you have backup jobs configured for storage snapshots with no fail over configured!). 1. Change the behavior when adding storage infrastructure s.t. backup jobs will failover to vSphere snapshots. 2. Allow backup operators to choose what snapshot method is used for Veeam zips. I had the same opinion /question about the storage integration default settings some years ago. The default setting after installation is "enable backup from storage snapshots". So no job is changed. Everything stays the same after you add a storage to storage infrastructure. The reason why the "failover to standard backup" checkbox is not marked is: customers would never realize that storage snapshots are not used, because everything is "green" then. I'm not sure how that relates to VeeamZip. Thanks for the response, but the fact is that the settings for the jobs are changed I experienced it myself. I had 20 total jobs change their behavior from vSphere snapshots to storage snapshots after the new storage infrastructure was added. It may be the case that this was because they were inheriting the default setting, but to say that "Everything stays the same after you add a storage to storage infrastructure." is just false. Also this does not justify changing the default setting for the application without notifying the operator. There is an easier and safer alternative to configuring no failover option for VM backups - log what backup method was used clearly in the GUI. I'm assuming if a user cares enough to integrate storage infrastructure with their Veeam environment they would also care enough to check the GUI logs for the backup job. Overall it just seems like a lazy design decision that no one has taken the time to change. As for VeeamZip; it uses the default backup method no matter what, there is no way to tell it to use a different method. So when the default method is changed when the storage infrastructure is added it will change every VeeamZip job you run thereafter. If the user could choose the backup method when initiating the job this would not be an issue. It would also be less of an issue if Veeam notified the user when changing default behavior. I will try to reproduce, but it will take some times as I currently re-build my lab. Do you maybe have a case for the settings changes? That would be an issue from my point of view. As mentioned earlier, the decision to not set this checkbox was set intended. There are pros and cons for both sides and you can change the setting in the way you prefer. I'll keep you posted, but as mentioned, it will take some time. sorry for my late answer. I tested your statements from above and if you can reproduce them, then I would like to engage you to open a case. I could not reproduce your statements. The software does exactly what I described earlier. It does not change any values when adding a storage. I recorded a small video (not edited, so it might be a good idea to watch at higher speed) where I set default values and added a storage.